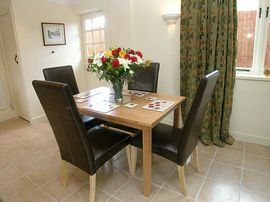 All cottages can be booked on their own or together sleeping up to 14 people. Shakespeare Holiday cottages are in a superb rural setting yet only a 5 minute drive from Shakespeare's Stratford-Upon-Avon. Juliet Cottage has been lovingly restored to a exceptionally high standard into this magnificent cottage you see now. The cottage is set within a quiet position with lovely open countryside views. There are 10 acres of natural grounds surrounding Shakespeare Holiday Cottages. Walk through the hall way to enter this beautiful cottage, it has a large open-plan living/dining-room with exposed beams. 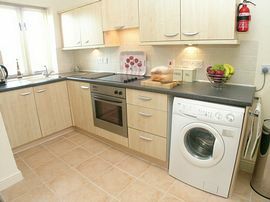 The kitchen area has modern fully fitted units with ceramic floor throughout. From the kitchen/dining room step out through a stable door to an enclosed courtyard. 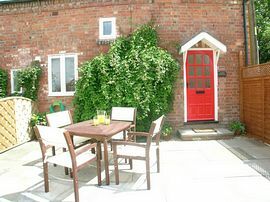 The front of Juliet cottage has a terrace area with patio furniture. Level parking space for two cars. First Floor: Enter the double bedroom with a Juliet Balcony, built-in wardrobes and beams. Security safe and hair dryer provided. There is also a single bedroom. An additional fold-up bed for the fourth person can be set-up in the master bedroom. The first floor has luxurious carpets. The bath room has a W.C., bath and separate shower cubicle, heated towel rail and ceramic floor. 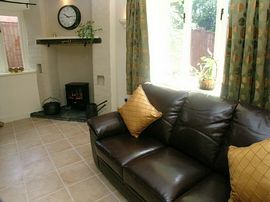 Juliet Cottage comes complete with freeview TV, DVD/CD player, free broadband Wi-Fi connection. Electric hob and oven, ample crockery, cutlery and utensils. Washing machine, tumble dryer, microwave, toaster, iron, ironing board and vacuum. Cots and high chairs are free of charge. Duvets with linen and towels provided. Hot water, electric and electric central heating are included. Shop 2 miles. Pub 1 mile. 2 Bedroons, Lounge, Kitchen, Bathroom, Shower, Patio, Parking. 3 Bedrooms, Lounge, Kitchen, 2 Bathrooms, Patio, Parking. 2 Bedrooms, Lounge, Downstairs WC, Kitchen, Bathroom, Parking and Garden. If you require accommodation for more than 6 people then multiple cottages (sleeping up to 14 people) can be booked, subject to availability. Also, coming soon, a large Country House, close to Henley in Arden and Stratford Upon Avon that will sleep up to 30 people or smaller numbers if required. Superbly Appointed to a very high standard. Digital TV plus Wi Fi Internet. 10 Acres of land to explore in the stunning countryside of Stratford-Upon-Avon although only a 5 minute drive from Historic Stratford. Juliet, Hamlet, Measure and Falstaff can be booked for anything from 2 nights to several weeks. 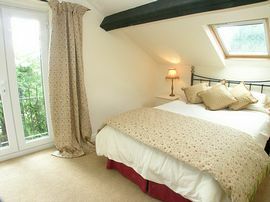 Prices range from £150.00 to £295.00 based on a 2 night stay. Please email or telephone for availability and cost. For details, please telephone, Email, or visit our website, see the link at top of this page.